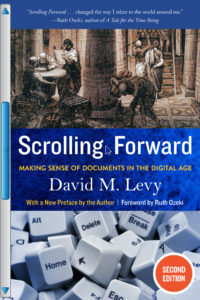 Scrolling Forward is a meditation and reflection on the nature of documents — written forms — at the moment when digital materials were just beginning to supplement and supplant paper documents. Highlighting the deeper continuity present in this digital transformation, it offers readers an understanding of the crucial role that documents play in the creation of a stable and meaningful world. First published in 2001 and reissued in 2016 in an updated edition, its observations and conclusions are just as relevant today as when they were first formulated fifteen years ago. The new edition includes a foreword by Ruth Ozeki and a new, chapter-length preface by David. Materials copyright 2019 David M. Levy.